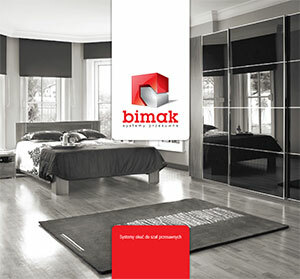 Bimak has been a dynamically developing company since its foundation in2001. 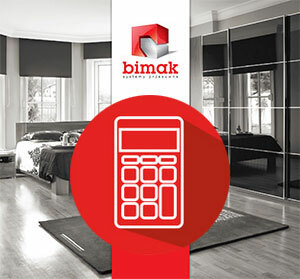 Fromthe very beginning of our business activity we are associated with the furniture accessories market. Since 2007, we have successfully specialized in the design, manufacturing and sale of aluminium systems forsliding doors. We offer a wide range of solutions used for the production of sliding, folding, side-hung andpass doors. In2013 we extended our offer to Q-Box drawer systems with fully extending drawer guides. We hope that our offer will meet your expectations, and will become a solid foundation for fruitful and long-term cooperation. From the beginning of our business activities we have been accurately identifying and satisfying the needs of the furniture market in Poland andabroad. We do our best to meet the requirements of our customers. Therefore, we continue our efforts to provide the highest quality products, best service, as well as the incessant expansion of our product range. In our offer we have sandblasted aluminium profiles with a galvanic coating ofa thickness of over 15 microns. It is aunique solution on both Polish and European markets, which guarantees modern, attractive appearance of the cabinets manufactured using our products, as well as their durability. All door hardware is provided with ball bearings to ensure long-lasting, quiet and trouble-free operation. They have been acknowledged by compliance certificate PN EN 15338,2010. Knowledge, skills and passion for what we do translates into the quality of our services.